When my nephew was a young boy, he had a favorite cake we named Roger Cake in his honor. It was a multi layered nut torte, filled with a lightened lemon curd, and covered in chocolate ganache. No recipe existed for the Roger Cake. It was concocted and baked by the housekeeper of our cousins from Toronto, who like so many European cooks, rarely followed a recipe. Over the years I've tried to recreate it with varying degrees of success. One day it occurred to me to try a version made with crêpes. I'd been inspired after sampling the Mille Crepe from Lady M in New York City, a cake that will set you back about $75.00. I'm not going to lie, this isn't something you can whip up in an instant. It takes some time to make, but if you plan ahead, it comes together quite easily. 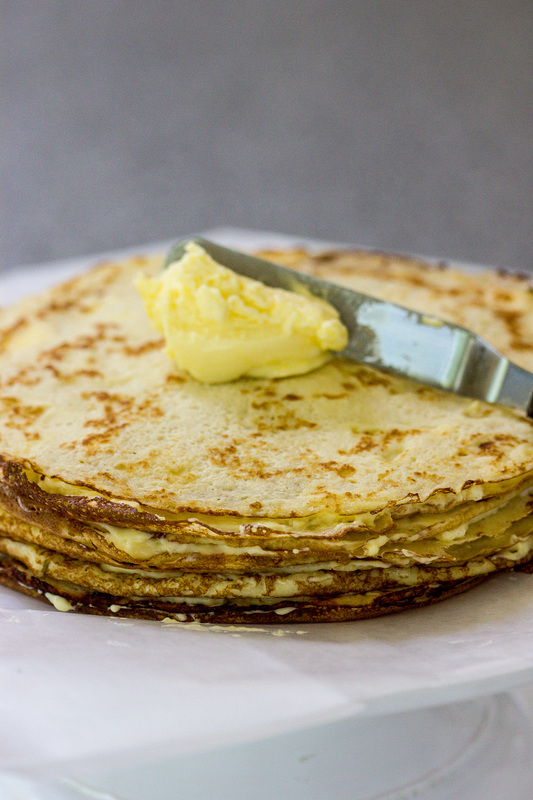 The crêpes can be made in advance and stored in the freezer for several weeks. The lemon mousse can sit in the refrigerator for up to 2 days and the ganache takes but a few minutes to whip up once the chocolate has been chopped. Then it's just a matter of assembly and I guarantee your efforts won't go unnoticed. I served this on Father's Day to Roger and the rest of the family. It brought back many good memories. Stir together the flour, sugar and salt. In another bowl, whisk together the eggs, melted butter, and milk. Make a well in the center of the dry ingredients and pour the wet ingredients into the well. Whisk together until well combined and no lumps remain. Next day, remove from refrigerator and give the batter a quick stir. 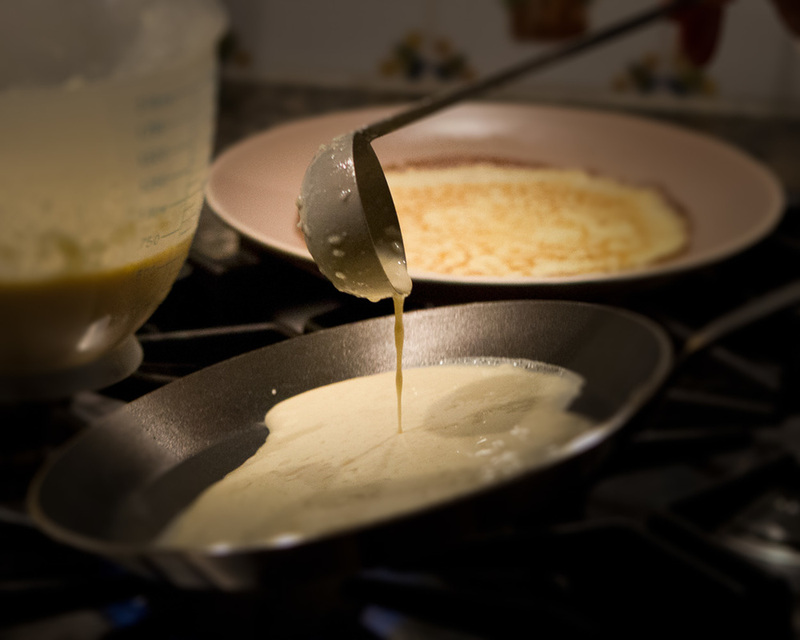 Heat a crepe pan or 8" skillet over medium heat. Add 2 T. butter and and melt to coat the bottom of the pan evenly. Pour about 1/4 cup of the batter, tilt the pan to evenly distribute the batter. Cook for 1-2 minutes until the edges curl and the bottom browns. Using a spatula, carefully flip it over and cook the other side for about 30 seconds. Remove to a plate and stack them one on top of another. The crepes can be made up to 2 days in advance, wrapped in plastic wrap and stored in the fridge or frozen up to 2 weeks. THIS IS A DOUBLE RECIPE AND WILL MAKE ABOUT 25 CREPES. You will need 15-20 for the cake so don't worry if some don't turn out well. Sprinkle gelatin over water and let stand a few minutes until softened. Whisk together eggs and yolks in a small, heavy saucepan. Whisk in sugar, lemon zest, and lemon juice. Cook, whisking constantly over medium low heat until mixture is thick enough to coat the back of a spoon, about 8-10 minutes. Add gelatin, stirring constantly until gelatin dissolves and mixture is slightly cool. Add butter, a few pieces at a time, stirring after each addition until smooth. Press a piece of plastic wrap directly onto the surface of the curd to prevent a skin from forming and refrigerate until set, 2 hours or overnight. Stir curd and gently fold in whipped cream. In a saucepan, bring the cream to a boil. Off heat, pour the hot cream over the chocolate. Allow to sit for 5 minutes, then whisk until the chocolate is completely melted. Place the bowl in a slightly larger bowl filled with ice water. Whisk until the ganache reaches the consistency of a soft frosting. If it gets too hard, you can set it in the microwave briefly to soften. Place a crepe onto a serving dish. Continue until you have at least 15 layers. Frost sides with ganache, then the top.